Why do so many conservative politicians flock to the campuses of Liberty University, Wheaton College, and Bob Jones University? 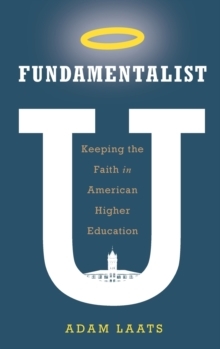 In Fundamentalist U: Keeping the Faith in American Higher Education, Adam Laats shows that these colleges have always been more than just schools; they have been vital intellectual citadels in America's culture wars. They have been unique institutions that have defined what it has meant to be an evangelical and reshaped the landscape ofAmerican higher education. In the twentieth century, when higher education sometimes seemed to focus on sports, science, and social excess, conservative evangelical schools offered a compelling alternative. On their campuses, evangelicals debated what it meant to be a creationist, a Christian, a proper American, all within the bounds of Biblical revelation. Instead of encouraging greater personal freedom and deeper pluralist values, conservative evangelical schools have thrived by imposing stricter rules on theirstudents and faculty. If we hope to understand either American higher education or American evangelicalism, we need to understand this influential network of dissenting institutions. Plus, only by making sense of these schools can we make sense of America's continuing culture wars. After all, our culture wars aren't between one group of educated people and another group that has not been educated. Rather, the fight is usually fiercest between two groups that have been educated in very different ways.